You’ve read about it in the most recent RBC newsletter, but what does it look like? 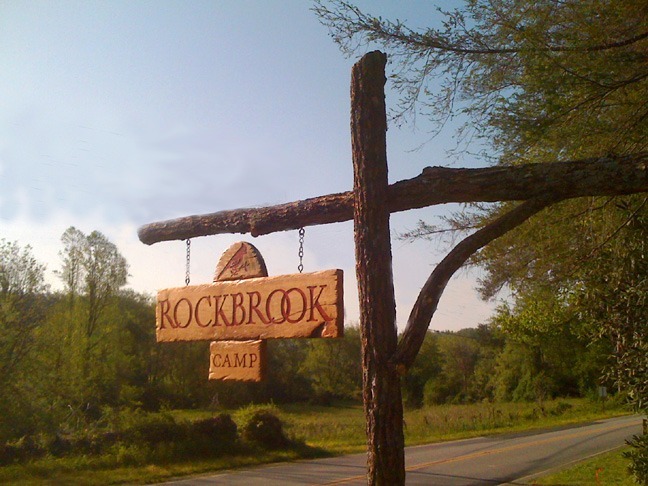 Well, here it is, the new Rockbrook Camp sign! The old one couldn’t be repaired, so we asked local Brevard artist Matthew Lee Hoxit to design and build a new sign for the camp entrance. After showing him some vintage Rockbrook catalogs, and selecting one of the old fonts we liked, Matthew put together this design, found the local materials (oak and locust), hand carved the sign, and installed the whole thing. We love it, and think you will too! 8 Responses to "New Rockbrook Camp Sign"
I’ll c it in 8 days !!!!! i cant wait to see it in person!!!!!!! That sign looks awesome! And in 25 days I’ll see it in person! Can’t wait till camp! Looks great! Can’t wait to see it in person!